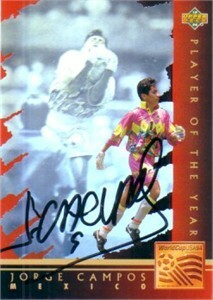 1994 Upper Deck Player of the Year hologram soccer card autographed in black marker by legendary Mexican National Team goalkeeper Jorge Campos, who also played for the MLS Chicago Fire and Los Angeles Galaxy. With certificate of authenticity from AutographsForSale.com. ONLY 2 LEFT.